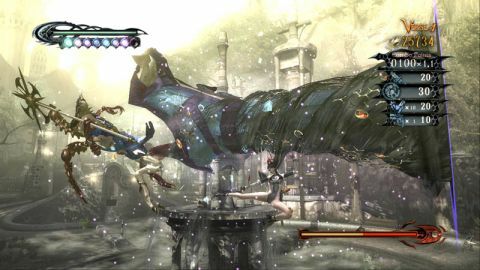 I’ve basically ignored Bayonetta for the last 12 months, because it never struck me as something I’d be interested in - I was never that impressed by Devil May Cry and similar games which to me just felt like random button mashers, and Bayonetta seemed to be relying far too much on how much leg and cleavage its main protagonist could show in any given screenshot. I’d pretty much written it off as a cycnical attempt to recycle old ideas but to tap into the frustrated teenage male demographic with guns, kung-fu, the occult, blood and cleavage - clearly a winning formula in that market. I was completely surprised, therefore, when I read Edge this month and they gave it a 10, citing its inventiveness and variety. I don’t buy Edge for the reviews particularly, but they’re always hard to please and when they rave about something, it’s often worth taking notice. So, I downloaded the Bayonetta demo and had a go this weekend. First impressions were a resounding ‘WTF?! !’ - confusion, chaos on-screen and ultimately, death. But, after retrying with the benefit of the tutorials, I started to get the hang of it. And surprised myself with the number of belly laughs it provoked and how much fun it was. Because make no mistake - Bayonetta is utterly insane. It’s as if the designers have necked a whole ton of LSD and spent 3 sleepless days watching manga, playing Street Fighter and Contra, and doodling images of oversized fantasy anythings that can transform into anything else at a moments notice. Preferably while plummetting from orbit. There’s so much going on on screen, and even during the demo the ante keeps getting upped to the extent that you’re chuckling at the sheer ridiculousness of it all, that you would think it would get hard to play. At times it does get a bit busy, but they seem to have made the controls and camera angles appropriate such that most of the time it tends to work extremely well. It looks gorgeous the whole time, and the frame rate stays outrageously high given the amount of things going on (note: this was on 360 - allegedly the PS3 version isn’t quite as smooth, so you’ll have to grab it and judge for yourself there). Edge compared it to Super Mario Galaxy in terms of how well they managed to derive a camera angle appropriate for a given scenario, regardless of how outrageous, and I could see that from the demo to a degree. In short, I never remotely expected to like Bayonetta, but despite myself I’m really keen on it now. That’ll teach me to judge a book by its cover, or rather a female protagonist by how much leather she’s wearing. With it being released on 8th January, next month seems to be the new Christmas.